Low back pain can happen when you lift, reach, or twist your spine. 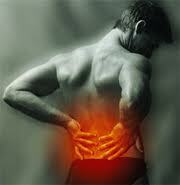 In fact, almost everyone has low back pain at one time or another. Overuse, strain, or injury – Back pain that cause by poor posture. Herniated disc – Also known as slipped disc. Compression fractures – Occur when a spinal bone collapse as a result of osteoporosis. Scoliosis – A spine problem you were born with.